I studied Bibliography and Research in graduate school under the distinguished scholar John T. Shawcross. In addition to compiling bibliographies for my own books, I produced "Science versus the Paranormal: An Annotated Bibliography" for Behavioral & Social Sciences Librarian (vol. 15, no. 1 , pp. 19-30). 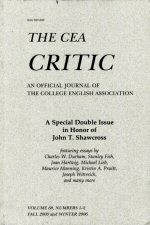 My bibliographic research includes discovering the "lost" edition of The Sot-Weed Factor (see "The Case of the Missing Edition," The CEA Critic, vol. 68, nos. 1-2 [2005-2006], pp. 111-116).